Harris's Hawks are one of the few social birds of prey. In the wild they often live, breed and hunt cooperatively, with group size ranging from several to 7 Harris's Hawks (Dawson and Mannan 1991). We hunt with a group of 4 to 6 captive bred Harris's Hawks. 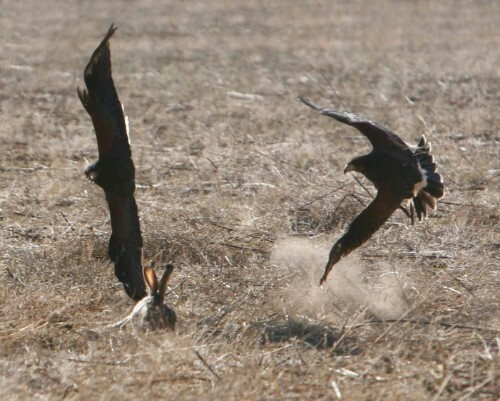 This probably provides too much action for most falconers, but many will enjoy hunting with a cast. We recommend flying two or more Harris's Hawks together. Harris's Hawks enjoy being together and above all, they love to hunt together. In no time you will become an effective falconry team. When you walk up to a hunting spot, it's not a question of if you will catch game, it's only a matter of how many. Live a little. You and your hawks will be better for it.